This book provides a systematic, highly practical introduction to the use of energy principles, traditional variational methods, and the finite element method for the solution of engineering problems involving bars, beams, torsion, plane elasticity, trusses, and plates. It begins with a review of the basic equations of mechanics, the concepts of work and energy, and key topics from variational calculus. It presents virtual work and energy principles, energy methods of solid and structural mechanics, Hamilton’s principle for dynamical systems, and classical variational methods of approximation. And it takes a more unified approach than that found in most solid mechanics books, to introduce the finite element method. Featuring more than 200 illustrations and tables, this Third Edition has been extensively reorganized and contains much new material, including a new chapter devoted to the latest developments in functionally graded beams and plates. 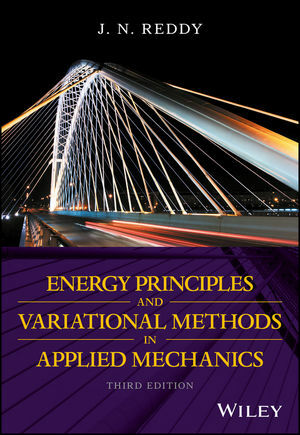 Energy Principles and Variational Methods in Applied Mechanics, Third Edition is both a superb text/reference for engineering students in aerospace, civil, mechanical, and applied mechanics, and a valuable working resource for engineers in design and analysis in the aircraft, automobile, civil engineering, and shipbuilding industries. J. N. REDDY, PhD, is a University Distinguished Professor and inaugural holder of the Oscar S. Wyatt Endowed Chair in Mechanical Engineering at Texas A&M University, College Station, TX. He has authored and coauthored several books, including Energy and Variational Methods in Applied Mechanics: Advanced Engineering Analysis (with M. L. Rasmussen), and A Mathematical Theory of Finite Elements (with J. T. Oden), both published by Wiley.